Chris has provided this Lysol toilet bowl cleaner review. I use Lysol Complete Clean with bleach toilet bowl cleaner and I love how well the product works. 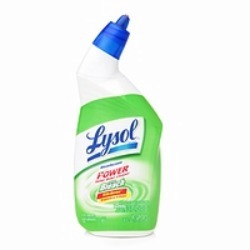 I use Lysol products often when cleaning my bathroom and I know how clean everything gets. The toilet bowl cleaner has a nice thick formula that clings easily to the sides of the bowl and under the rim. Because of this, I don’t have to use as much as some other brands, and the bottle lasts much longer. The product works well with any standard toilet bowl brush. The cleaner has a pleasant smell with just a mild scent of bleach. The smell of bleach is not at all overpowering and it leaves the bowl smelling fresh. With the bleach added I know the toilet is disinfected and deodorized. I have never had any skin problems or allergic reactions using this cleaner. I have accidentally dripped some onto my hands before and it has never caused any problems, but I did wash it away pretty quickly. Thanks Chris for your Lysol toilet bowl cleaner review. Has anyone else used a toilet bowl cleaner, and what to share what they think about it? If so, you can share your toilet cleaner reviews here, or read others that have already been submitted. 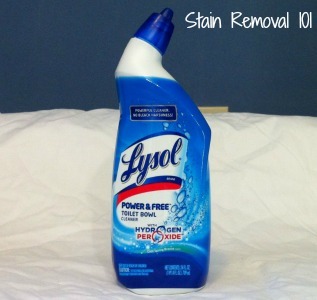 I recently tried the Lysol Power & Free toilet bowl cleaner on all the toilets in my home. I was first attracted to this new line of products from Lysol because of the fact that it does not use bleach to disinfect and remove stains and get things clean, but instead uses the power of hydrogen peroxide. It isn't, per se, a green cleaner, but it does use a product that many think is better for the environment than bleach. The first thing I noticed about this product is that it was a bit thin. I like my toilet cleaners to be thick, so they really stick to the sides of the bowl to get everything clean, but I will say it didn't seem to make much of a difference in this case. One thing I immediately noticed when squirting this in my toilet though is the scent. It is quite distinctive, and rather medicinal. I felt like maybe I was in a hospital or something. It wasn't unpleasant and it dissipates quickly and completely, especially once you flush, but I think the hydrogen peroxide makes it have that interesting smell. Further, although some people have complained that Lysol's caps for their toilet cleaners are giving them problems, I really didn't have a problem opening or using this product. I would love to hear from more people who've used this product, or anything else from the Lysol Power & Free product line. You can share your reviews of these products here. Further, you can read even more toilet cleaner reviews here, for lots of different varieties and brands, if you're looking for a good one, or I'd love it if you shared your review as well! Michelle also is sharing her Lysol Disinfectant Power toilet bowl cleaner with bleach review. I use Lysol Toilet Cleaner, with Bleach, to clean our toilets. I buy this product because it disinfects and is from a brand I trust. I like the bottle shape because the neck on the bottle makes it easier to get the cleaner under the rim and it has a good child resistant cap. The smell is a little strong but most products with bleach usually are. This product is very easy to use because all you have to do is flush the toilet, put the liquid in the toilet, let it soak for 5 minutes, clean with your toilet brush then flush again. It does a great job cleaning and you don't have to do any hard scrubbing. It does not harm our toilets at all. I would recommend this product to everyone looking for a toilet bowl cleaner. It is very reasonably priced and does a great job. Michelle, thanks for your Lysol toilet cleaner review. I think you make a good point, when discussing cleaning products, which is that of safety, especially for children and pets. Having a good child-proof bottle is quite important, especially for something as dangerous as toilet bowl cleaner, if ingested or even just getting it onto your skin for a prolonged period of time. Obviously, all cleaning supplies should be stored in an area not accessible for children and pets, but having the added protection of child-proof bottles is also good. So, again, does anyone else have a toilet bowl cleaner they like to use? If so, share your toilet cleaner reviews here, or read even more already submitted. Impossible to open cap. Completely over child proof. Require age proof that you don’t need it. Will buy something I can open!! !